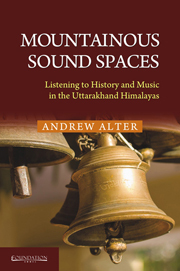 This book is intended, not only for an academic readership, but also for those who simply want to discover something about the musical practices of musicians in the Himalayan region of Uttarakhand. Consequently, I have included some descriptive material that is widely available elsewhere. This is for the benefit of those who are less familiar with musicology and for those who may not have travelled to Uttarakhand before. Writing for two different audiences inevitably requires compromise regarding the tone of the language and the technically specific terminology that must be used. I hope these compromises do not alienate either readership. As with any book, it is limited in scope to those practitioners whom I have met and to those experiences that I have had. Nonetheless, I hope these stories will encourage the reader to reflect on the way sound and music are influenced by the geography in which they are made. Some segments of this book have appeared in earlier journal publications. They are presented here either with significant modifications that take an account of recent field research, or with adaptations that create better coherence within the narrative of this book. They appear with permission of the editors. Chapter 1 is a significantly revised version of an article published in the journal Asian Music in 1997/98. All the musical examples are new and are presented in a manner that is more inclined towards the South Asian context. The ideas in this earlier paper have been significantly expanded to provide more detailed citations as well as more coherent musical examples. In addition, further information related to military history and contemporary media has been included. Chapter 5 is an article originally published in 2012 in the European Bulletin of Himalayan Research titled ‘Flutes, Sprites and Mountainous Geographies’. Connections between drum notation, drum syllables and the power of oralized sound are audible/viewable in numerous rituals throughout Uttarakhand. Whether such rituals involve a procession with a specific temple deity, or whether they are part of more general ritual activity associated with festivals (melās) or outdoor jāgaraṇ, references to Śaiva-Śākta theologies and practices are frequently present. The small town of Purnath (pseudonym), which is located in central Garhwal, holds an annual melā (festival) that provides just such an example. Events associated with the deity's original acquisition are re-enacted by townspeople as both a form of worship and as a dramatic spectacle. In this way, the melā provides an opportunity for participants to simultaneously worship their deity and reaffirm their interlinked identities. This chapter examines the melā by documenting and analyzing the unique musical repertoire used to accompany what is essentially a sacred performance. The deity's connection to Shiva as well as the town's association with Nath practitioners makes the Purnāth Melā a particularly apt space within which to examine connections between ritual practice and drum repertoire. Knowledge of the musical repertoire that accompanies the ritual aspects of the Purnāth Melā is maintained by specialist drummers who live in the town. Their explanation of how music is related to historical re-enactment provides the framework for the description presented here. Metaphysical explanations of music's central place in the existence/creation of the world clarify the role of sound in ritual action and provide the basis for how sacred and historical realms may become merged. As demonstrated in Chapter 3, references to musical scenes and musical instruments – huṙkīs, nagāṙās, flutes – are a regular feature of many pawāṙās in Uttarakhand. The analysis presented in Chapter 4 highlights the possibility that performance practices associated with oral tradition may well account for the recurrent references to such scenes. Perhaps the most ubiquitous of all such scenes are those with the muralī (flute). The iconic nature of the flute and its sound within a mountainous geography deserves closer attention. This chapter therefore focuses closely on these scenes in order to more fully explore the nature of oral tradition and also to more closely examine the role of the flute within the musical practice of the region. The story of Jitu Bagadwal is the most well-known pawāṙā in Garhwal that is focused on the flute. In the central episode of the story, Jitu plays his muralī on a high mountain pasture and thereby attracts the mountain sprites that ultimately cause his downfall. The sound of the flute is thereby linked to the dangerous supernatural world of sprites and to the sonic realm of a mountainous geography. A number of recording artists have released commercially available audio tapes of the story, including Uma Shankar Satish (1987) and Hukam Singh Yadav (n.d.). Though it is primarily a Garhwali story, Jitu Bagadwal is known in parts of Kumaun. The story has become somewhat iconic for the hill regions of Uttarakhand and is frequently interpreted through various artistic mediums including shorter songs, drama and dance. Praise to the five named deities! The first king of the Kanturis was Raja Ajaybitha, then Gajebitha, then king Sujana Deb, then Amar Deb, then King Pithaura, then King Prithipal. King Pithima Deb was the father of Dhama Deb whose mother was Muladeyi. With these words, Bhag Chand, a huṙkiyā (drummer) from the village of Naugaon in Pauri district of Uttarakhand, began to sing the pawāṙā (heroic epic) of ‘Bijula Naik’. I had organized a performance of this specific story in April of 2004 at my own house and a small group of about five people had joined us for the occasion. This chapter explores the dynamics of that performance by focusing on the story of Bijula Naik as well as the performative elements of Bhag Chand's singing and drumming. The sonic realm of a pawāṙā draws one into the world of the characters and transports one regularly between the natural world of the event and the supernatural world of the story. Bijula Naik is the illicit son of Dhama Deb and Chhamuna Patra, he being the king of the Kanturis, and she being a low caste dancer. Though the story does not provide the details of the illicit affair, the disparity between their castes as well as Chhamuna Patra’s status as a dancer in the king’s court provides an underlying tension that continues throughout the story. To begin the story’s performance, it was essential for Bhag Chand to acknowledge the presence of the world of gods through naming them in advance of his story. His skills as a ritual specialist would be essential in controlling any devtās (deities) who might join us for the performance. In an old book on the history of Garhwal written by Harikrishna Raturi, the author presents extensive lists of the various caste names of families in Garhwal. The book was originally published in 1928 during the days of the Garhwali Raja and would seem to present a first-hand account of practices from that time. Within his list of untouchable castes, Raturi (1988 : 90) lists ‘aṭpahariyā’ and describes these as: ‘nakarāchīs [players of the naqqara drums] who used to sound out the eight times of day on the naubat in the naubatkhānā of the court', Very few present-day musicians play these kinds of drums though drummers regularly refer back to a shared memory of court drumming. Raturi's statement is significant because it is one of the few sources from the time that mentions musical activity in the Garhwali rājā's court. As the previous chapter illustrates, musical instruments as well as their combinations within specific ensembles are frequently associated with political power and military conquest. While instruments may hold a variety of symbolic meanings in different contexts, their use as sonic expressions of power may be heard in numerous musical traditions throughout the world. The adoption of the bagpipe into village-level musical practice as well as that of the Garhwal and Gorkha Regiments of the Indian Army enmeshes a complex history of imperial power within local sonic expressions of regional identity. Bazaars in most towns throughout Uttarakhand offer the usual merchandise one would expect to find in a North Indian urban market. Street vendors compete for space in front of more permanent shops as crowds of pedestrians, motorcycles, cars and buses squeeze through the narrow streets. Most of the goods are brought up from the plains while some local merchandise may be found scattered among the imported items. Distribution networks of a capitalist economy ensure employment for wholesalers as well as truck drivers responsible for moving goods between markets and distribution points. Hill potatoes, cucumbers, pumpkins, beans and apples make an appearance in market displays beside spinach from Punjab, oranges from Nagpur, Guavas and Mangoes from UP and eggplants from Haryana. In other shops, household goods and readymade clothing arrive from production centres in the plains. Metalware shops display the standard steel plates, tumblers, cutlery and kitchen utensils that one would expect, while brass and copper banṭhās (water containers) are added for local residents wanting to purchase something from their own region. In the back of these same shops there might also be a brass barrel-shaped ḍhol or a copper bhaṅkorā (trumpet). Frequently in these towns there is also a vendor selling compact discs, VCDs and DVDs. These have largely replaced the audio cassettes and VHS tapes that were once the dominant analogue formats of the 1980s and 1990s. Music vendors target a clientele who want to hear the most recent popular hits of the film industry or see the most recent compilation of dance ‘item numbers’ from Mumbai. Nonetheless, as with items for sale in other shops, Uttarakhandi products find space, albeit a more marginal space, next to the imports. Big name local singers provide a Garhwali nuance to the commodified sounds and VCDs on offer. Garhwali regional films use the voices of these stars as playback singers to express a local identity within a style clearly influenced by Mumbai’s dominant aesthetic. When I first listened to Kulanand Juyal's cassette, Gaṙhwālī Jāgar (Rama 140, 1988), I concentrated on its sounds. It wasn't the sort of cassette I would play as background music – it doesn't suit that situation – or at least not for me. Without paying much attention to it, I listened to it as I had habitually done with other cassettes. I listened to the words. I concentrated on trying to follow the story of Bāṇāsur as best I could and this was not easy, given my modest linguistic skills. I found my mind wandering to the drumming, and I began comparing it to what I was familiar with from other performances. The drum dropped out for periods and these absences were longer than I was used to. The bhauṇ pitches at the end of each line were more stable than I expected – quite unlike those of Dilwar Singh with whose style I was making a comparison. I was trying to identify technicalities within the sounds of its original performance; somehow trying to imagine the world of its original recording as well as what I unconsciously assumed to be conventional for the location of this kind of performance. Habitually, I was creating an imagined world constructed from my past experiences – experiences of listening to jāgars and cassettes. Without thinking, I had moved into an imagined space, assuming myself to be somehow next to the performers – not in a specific location, but in a generic Garhwali space within my ‘mind's eye’. Gorakhnath is a tantric figure revered by a number of Hindu Shaivite sects. These sects exist particularly in Nepal, but are also found elsewhere in, or near, the Himalayas as well as in parts of northern India including Rajasthan and Bengal. However, Gorakhnath is a particularly significant figure for many in the Himalayas. For instance, Maskarinec (1995: 7) mentions that shamans in Nepal regard Gorakhnath as the ‘highest’ spiritual authority. The suffix –nāth literally means ‘lord’ or ‘master’, and thus is used in many contexts. Most broadly, this suffix is used in association with the names of specific temples and their principal deities, such as Kedarnath, Tungnath, or Bodinath, highlighting the reverence people hold for these places of worship and their deities. In addition many people more generally refer to ‘Naths’ as those who follow the teachings of Gorakhnath. They are also referred to as Gorakhpanth – meaning the sect(s) (paṅth) of Gorakhnath. Little is really known about Gorakhnath as an actual historical figure. He may have lived about a thousand years ago and his teachings as well as those of his guru, Matsyendranath, have shaped an esoteric philosophical tradition that is carried on today by Gorakhpanthis. Kanphata Yogis are the most well-known sect of ascetics who revere Gorakhnath as their founder and primary gurū. As Bharati (1982: 873) suggests, the sect is not only a tantric (Shaivite and Shakta) order but also has connections with the Vajrayana Buddhist tradition. Most pawāṙās incorporate stories of heroic protagonists like Dhama Deb and Pithima Deb. This is why the genre term pawāṙā is largely synonymous with vīr-gāthā (hero epic). While the etymologies of the two terms are different, they both identify genres of performance in which heroic tales are ‘sung’. The term vīr-gāthā emphasizes the sung nature of these stories through the root verb ‘gānā’ – ‘to sing’. In addition, the term pawāṙā may be etymologically linked to immigrant Rajputs named ‘Panwar’ like king Ajay Pal who was from the Panwar family. A further significant fact related to all pawāṙā performances, is their existence as a tradition of oral practice. Consequently, the pawāṙās discussed in various places in this book illustrate patterns and themes that are characteristic of oral tradition. Unlike some areas of the world where written/printed versions of stories interact with traditions of oral performance, in Uttarakhand, if published versions of pawāṙās exist, they are frequently the result of direct transcription from oral practice. As far as I am aware, huṙkiyās who still perform in village locations today do not access or refer to written sources; nor do they maintain written records to aid their memory. Consequently, the scholarly field of ‘oral tradition’ provides a valuable theoretical framework to dig deeper into the sonic worlds of pawāṙās in Uttarakhand. The Himalayas are usually assumed to encompass a space in which the vertical dimension is emphatic. They ‘tower’; they ‘thrust’; they ‘perch.’ Climbers go to the Himalayas to move upwards and reach the peak. Tibet – ‘the roof of the world’ – lies somewhere high above the vantage point of the viewer from the plains. British surveyors like George Everest and Andrew Waugh could see the highest of these mountains sticking up in the distance, a natural border to their newly colonized subcontinent. Well before the British, the Pandavas – heroes of the Mahābhārata – were exiled for thirteen years into the mountains. Later, they ended their days moving upwards again towards that inaccessible high ground of eternal snow. Here, Shiva – carrying a drum – meditated in his mountain abode at Kailash. Verticality pervades our human visual imagination of a Himalayan space. However, their sonic space is equally integral to the mountains – one that is less considered. It remains invisible and exists in dimensions that are different to the three visible dimensions. Mountains are characterized by mystic silence, yet their spatial dimension and magnitude seem to echo sounds of those who live amidst, or travel through them. This book presents a number of stories about musical practice in specific regions in the central Himalayas. My words are descriptive of people and the sounds that define them. Those sounds are imagined in ways reflective of histories, conventional attitudes, geographical spaces and mythical worlds. The Himalayas being characterized by diversity of people and geographies are featured by different Himalayan spaces, for instance, urban environments with cosmopolitan populations different to rural settlements; high alpine geographies unlike the flat terai below the foothills; different countries, languages and religions. The previous three chapters examined the epic repertoire of Uttarakhand in order to provide details of indoor musical practice. In addition, the stories that were discussed provided texts and themes that could be fruitfully mined for perspectives on caste hierarchy and ideologies associated with instruments. The huṙkī drum and the voice of the performer were the primary components of the aural phenomenon of story singing. An overarching framework for the discussion of the stories, as well as the creative practices undertaken in their construction, was appropriately provided by theories of oral tradition. In contrast, this chapter shifts focus away from the huṙkī, and moves to a consideration of outdoor drums; namely the ḍhol and the damauṅ. Nonetheless, the discussion remains concerned with practices of oral tradition, particularly related to how ‘drum knowledge’ is vocalized in particular ways. Consequently, I seek to focus on the way drummers use syllabic recitation as a means to signify repertoire items and thereby oralize a practice of drumming. The implications of this oralization are considered within the broader context of drumming in other areas of South Asian practice. I have always been somewhat uncomfortable in describing and notating the drum syllables used by village drummers in Garhwal. On the one hand, when I became aware that some drummers used syllables to describe repertoire, it appeared logical to use these syllables in some way to notate and visually represent the drum patterns that I was listening to. On the other hand – though syllables represented an emic approach to drum stroke conceptualization – they never quite provided the direct link between sound and physical action that I was looking and listening for. Identifying particular vocalized syllables in relation to specific striking points on the drumheads was always more problematic than I had imagined it should be. The invention of the analog audio cassette was a critical moment in the history of music industries worldwide. Introduced in the mid-1960s, the technology spread rapidly in the 1970s until it was the dominant format for music sales throughout the late 1980s and early 1990s before it was replaced by the compact disk. As Manuel (1993) has documented, cassette technology was adopted in India somewhat later than in the rest of the world, but once it arrived, it had an overwhelming impact on the consumption and production of popular music. Similarly, the replacement of cassettes by compact disks occurred later in India than elsewhere. In regional music traditions, the arrival of digital formats and music downloads via the internet has now created a complex new environment for sales quite unlike the uniformity of the cassette industry. Coincidentally the Garhwali film industry was also founded at this time. The first Garhwali language film, Jagwāl [The Vigil] was produced by Parasar Gaur in 1983. This was followed by three other Garhwali films during the decade: Kavī Sukh Kavī Dukh (1984), Ghar Jawaiṅ (1986) and Kauthīg (1987) (Uttarkhand Cinema). Meghā Ā was the first Kumauni film produced by S. S. Bisht in 1987 and this too contributed to a growing Uttarakhandi film industry. The two most popular Garhwali films were undoubtedly Ghar Jawaiṅ and Kauthīg, both of which featured the music and voice of Narendra Singh Negi.